In all my years playing video games, I didn’t think a title about building a subway system could be any fun. 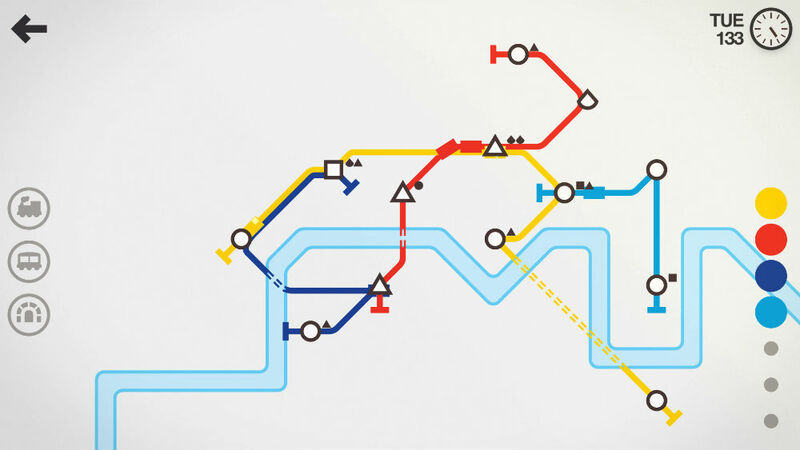 Well, publisher Playdigious found a way, thanks to a new game on Google Play called Mini Metro. In Mini Metro, you are tasked with building subway systems in real locations around the world. Unlike a Bridge Constructor game, Mini Metro is extremely minimalistic. Essentially, your construction will look like an actual subway map you would see at a station, with the different colored lines and stations. To start, you will be given a few stations that you need to connect. From there, more stations will pop up, plus more riders who need to get to varying stations. In order meet every rider’s needs, you must prepare the best routes and the resources you will need to complete an area. Should you invest in more cars for the growing amount of riders? Should you make a larger hub for the holding of passengers as they wait for a transfer train? All of these problems, and much more, are what await you in Mini Metro. For a couple of pro tips, in order to know where riders need to go as they appear at the stations, notice what shape they are. Stations are labeled as shapes (circles, triangle, square, etc), and rider destinations are the corresponding shapes. I will say, your first run may end poorly, but after a few tries, I was able to unlock a few new levels. The game ends once a station is overcrowded, so be sure to manage your resources as you unlock them. As I mentioned previously, you will be building subway systems in real world locations. The game starts you off in London, but once unlocked, you can create systems in New York City, San Francisco, and all across the globe. The game is priced at $4.99, but I must stress what your money is getting you. There are no ads, all features are unlocked (ability to speed up time in-game), and it also features a responsive soundtrack. As someone who hates in-app purchases, the $5 seems very well spent. Check it out, then let me know what you think.